agrees to give up their rights as a parent. into six sections that are extremely easy to view and print. You can Download the information and Legal Forms NOW! INCLUDES ONE FULL YEAR UPDATE SERVICE. YOU WILL BE ABLE TO RETURN, FOR ONE FULL YEAR, TO DOWNLOAD ANY NEW OR ADDITIONAL INFORMATION THAT IS ADDED TO THE DOWNLOAD SITE! The Most Complete Volume of Information about Voluntary Termination of Parental Rights Ever Offered! These forms are suitable for ALL states. (B) Instructions for completing the form. (C) Information on "Representing Yourself in Court." (D) How to serve the papers on the other people involved in the case. (E) "Tips on Finding People that Legally Need to be Served." What are the effects of giving up your parental rights? What is the legal process? Is the relinquishment FINAL? What are the specific rules for each state? ~~ State by State Relinquishment Terms, Requirements and general information-COVERS EVERY STATE! The legal effects of termination are substantial. 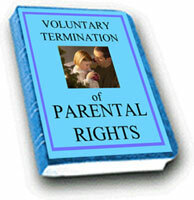 After termination, a natural parent's custodial rights are completely abolished. The order of the court terminating parental rights divests the natural parent of all legal rights, privileges, and obligations with respect to the child. Because this order of the court is so FINAL, extreme care must be taken, as a matter of law, by all of the parties to the relinquishment; the parent or parents, the child, the government agency involved in the case, and the court system overseeing the case. This is the most-complete volume of information ever offered on the subject of RELINQUISHMENT. Your printable copies of the BOOK and LEGAL FORMS listed below will be delivered in PDF format. If needed, a free download of Adobe Acrobat will be available. ALL computers (PCs & MACS) will be able to quickly and easily download this file. Ordering these Downloadable Books and Legal Forms is Easy & ENTIRELY SECURE! ~ Information on "Representing Yourself in Court"
~ "Tips on Finding People that Legally Need to be Served"